Some time back, I dubbed MSNBC the official network of insane liberal hate. 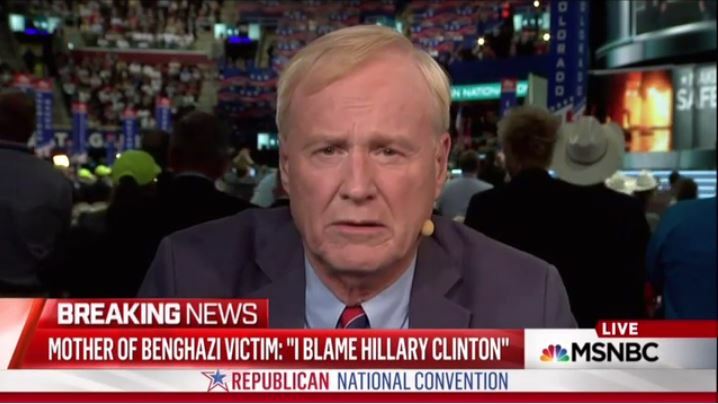 Responding to a speech given by Patricia Smith, the mother of one of those killed in Benghazi, Chris Matthews proved that assertion correct when he told his audience that he “doesn’t care” about Smith and he certainly doesn’t care about what she feels. “I don’t understand why the Republicans would choose to put this on primetime television when they have such wonderful stories of American heroism to speak to the American people. I think it was wrong. I don’t care what that woman up there, the mother has felt, her emotions are her own but for the country in choosing a leader, it’s wrong to have someone get up there and tell a lie about Hillary Clinton. It’s not true. It’s logically not true,” he said. He continued, calling Smith a liar while falsely claiming Hillary Clinton had nothing to do with Benghazi, even though she was the Secretary of State at the time of the attack. “It’s manifestly not true she had anything to do in that case, even if all of the arguments about what she said afterwards or Susan Rice said afterwards on Meet the Press are true and anybody who thinks about it for a second knows it’s not true and I think it’s wrong that they ruined their evening with this,” he added. Next articleIslamic Barbarism Covered Up; US Mosque Vandalized; Muslims In Texas Scream “Islamophobia” & CAIR Whines! Where’s The Nexus?